Tapio comes with one of the following Apple Adapters - Lighting to USB, Lightning to USB with recharge port or USB type C to USB type A (for iPad Pro). Tapio™ is a direct connect, lightning fast, dual switch interface that's suitable for everyday access, but can fly with the fastest gamer. With Tapio and an adaptive switch, a single switch user can have complete access to an iPad or iPhone and even macOS computers using Apple's Switch Control. A single switch scanner really can move the highlight to an app on the home screen, launch it, and scan to controls within the app. All that's left is to plug an appropriate adaptive switch into Tapio, and attach it to an iOS Device using an Apple adapter. Switch Control provides single switch access to Apple's iOS touch interface. The beauty of a robust direct connection is there are no worries with Bluetooth pairing, drop-outs, and sluggish connections. Forget about charging batteries, Tapio doesn't have any – it sips power directly from the iPad. Tapio is a complete switch interface solution – elegant, simple, fast, efficient, and agile (iPad and iPhone, Android phone and tablet, macOS, Windows, Chromebook and Linux computers). 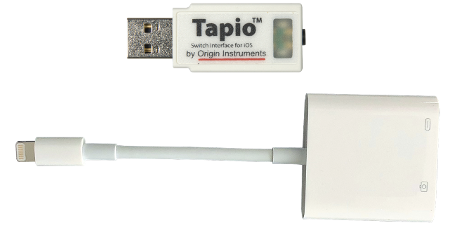 Tapio is a native USB switch interface that can be connected to an Apple iOS Device using an Apple USB adapter. It accepts industry standard 3.5 mm stereo or mono plugs, and directly interfaces up to two adaptive switches to an Apple iOS Device or computer. In addition to Apple iOS Devices, Tapio is a perfect interface for Android, Windows, macOS and Linux computers, and many Alternative and Augmentative Communication (AAC) devices. Tapio's integrated DIP Switch selects iOS Device specific modes, and mouse, joystick, or keyboard functions. Follow this link for an explanation of these modes and additional Tapio specifications. Buy Tapio and Apple Lightning to USB Camera Adapter. Buy Tapio and Apple Lightning Adapter with re-charge port. 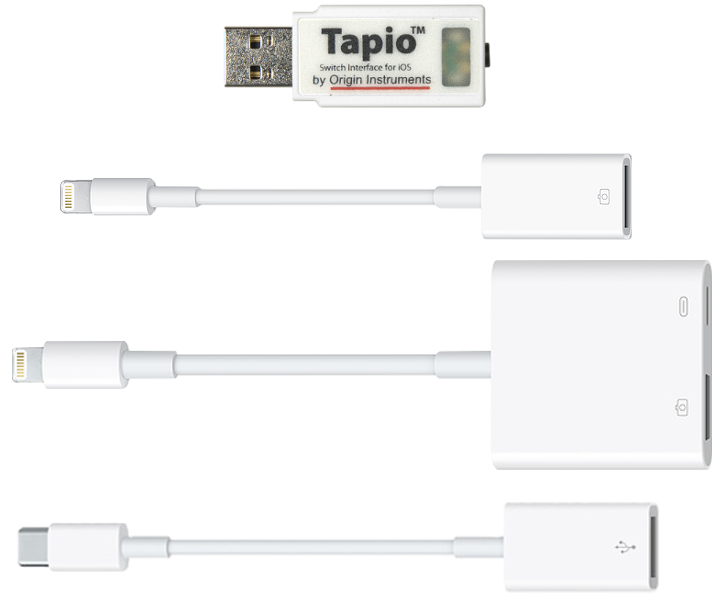 Buy Tapio and Apple USB-C Adapter (iPad Pro). Need an attractive and durable switch? 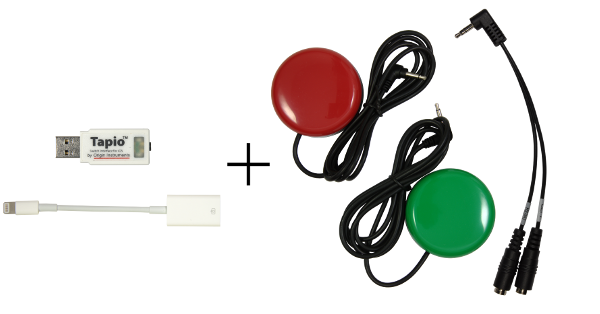 Teaming Orby with Tapio enables users to generate Apple Switch Control events, mouse clicks, joystick buttons or keyboard functions with simple taps on Orby. The Stereo-to-Mono Adapter is a useful accessory for Tapio, Swifty and HeadMouse. The stereo-to-mono adapter or splitter allows two single switches with mono plugs to be connected to Tapio, Swifty or the HeadMouse. The adapter may also be used with third party switch adapted devices. Not only do adapters look different they have different functionality, see "Not All Splitters are Alike" below. There are two kinds of audio "splitters" one breaks up a stereo signal into a mono left and mono right channel – the kind used for a switch interface. The other kind of "splitter" is used to share one stereo signal with two sets of headphones each with a left and right channel. You cannot tell which type you have by looking, it must be tested. Here is a simple test. Plug your splitter into an audio source (e.g. iPhone) plug your stereo headphones into one of the splitter jacks, if you only hear one of the stereo channels you have the correct splitter for a switch interface. If you hear both left and right audio channels you have the wrong splitter. This document has a more in-depth explanation. HeadMouse is a registered trademark of Origin Instruments Corporation. Tapio, PageBot, Swifty, Beam, Orby, Breeze, SofType, Dragger, and AirVoter are trademarks of Origin Instruments Corporation. All other trademarks are the property of their respective owners.